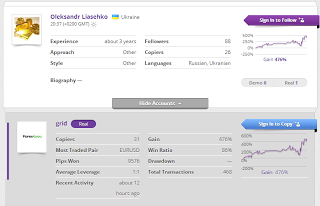 One of the best retail forex / social trading brokers around. Very clean reputation (you can hardly find any slur related to it, which is quite scarce in this field). Friendly service, friendly software, easy to understand even for complete beginners who never trader before. The focus is on fun and an intuitive UI rather than a place where experts can trade. View this comprehensive eToro guide to learn more. The eToro platform is very easy to use which makes it suitable to use for some who wants to start trading for the first time. Trades can be undertook on the Webtrader, the downloadable application for your computer, trading can also be done by Mobile with support available for the vast majority of phones. While the platform is pretty basic it’s functional and easy to use. Some have complained that it can be slow to respond sometimes. The lack of sophisticated charting tools also leaves something to be desired, but this doesn’t represent the end of the world. eToro’s most unique feature is it’s social trader functionality, essentially you can see the trades that other traders are undertaking. If you see a particular trader who you would like to copy, you can set aside some of your trading capital to follow their trading activity (up to 20%). This is a big selling point for eToro, though I’m not sure how I would feel about handing my money to the mercy of someone else. While I’m sure for some people social trading will be a huge selling and point as well as providing experience about how other people trade. As you would expect from a big player in the retail CFD world a free demo account is available which comes loaded with a $10,000 play balance, which gives you a chance to try out the etoro platform risk free. eToro also guarantee’s that you will not lose anymore than your initial deposit, which is a great security feature if they honor it. Which they presumably would considering the feature is advertised on the site’s homepage. A educational course is also on offer at eToro which is meant to introduce a new trader to the world of Forex and commodities trading. The CFD spreads offered on eToro are not deemed to be terrible but neither are they the best on offer. Though there is is clear clarity due to the fact that commission is also worked into the spread with their being no other commission charge. While not the best spreads there still tight enough that a good trader can make some serious profits. If the tightness of spreads are your primary concern it is clear that eToro isn’t the place for you. The customer service at eToro is generally considered be good. With live 24/5 Support and telephone trading on offer, eToro manages to tick all the boxes well. The account managers are generally considerate and try their best to get your issue resolved. eToro is regulated CySec, the regulatory authority of the Cypriot government. Many people are slightly wary of companies based in Cyprus but others have no such concerns about dealing with them. For more info on CySec check my article on Cysec. Personally, I think eToro makes it very clear where they are based and all the information is available in a very transparent away. I would and do feel safe dealing with eToro. Ladbrokes is one of the most well known gambling companies in the UK – offering online betting, and brick and mortar betting shops. Ladbrokes accepts worldwide clients (with some limitations of course), and offers clients the possibility of engaging in sports betting activities, casino activities, and poker. How does this related to financial skill betting? Binary Options have become much the range recently with numerous providers popping up offering Binary Options to prospective clients. However in response the gambling industry has popped up offering a variety of new financial bets, Ladbrokes is one of the leaders in this particular field. However one of the advantages of financial betting from Ladbrokes is that Ladbrokes offers a range of different types of financial bets, all in a Binary form (all or nothing bet). I will do my best to explain the three different types of financial bets on offer at Ladbrokes. First off their is Range Odds/Range Binary Betting, this type of financial bets offers a number of different ranges on which one can place bets. So for example if you pick a daily FTSE100 bet you will be confronted with a range of different possible price ranges all with different odds. Say the Index has opened at 6000, you may have the opportunity to place a range bet of 6010-6020. Meaning that if the Index closes within the particular range you specified you win the fixed odd bet, the less likely the outcome the greater the odds. This seems to me to offer traders with innovative methods the possibility of making some decent profits. Secondly there are Moving Odds/Moving Binary Bets, these bets are more like the standard binary bet you would find at a typical binary option site. But differ in the fact that they allow you to not just bet on a simple/up down bet. But they can also bet on a high and low value, allowing them to take a position on the market substantially falling or rising. 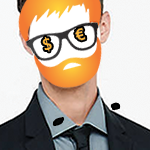 This allows the trader the possibility to exceed the type of return they would get at standard Binary Options site. During the time period of the bet the high, low and mid levels stay the same but the odds change to reflect the likelihood of each different outcome. While this adds an extra degree of complexity it also allows a person to hedge their positions over the course of a day (assuming their entering into a daily bet). Finally there is the option of a Static Odds/Binary Bet, this works exactly like the moving odds bet apart from the fact the high, low and mid level positions move throughout the day, but the odds are fixed each time you open a bet. This kind of Binary Bet is most similar to the type of Binary Bets offered at Binary Sites such as OneTwoTrade etc. But it still has had the added complexity of allowing you take a more extreme position on a particular financial instrument. Regulation: Barclays Margin FX is a trading name of Barclays Stockbrokers Ltd. who are regulated in the United Kingdom. Features: Foreign Exchange service provided by a well known international bank. Barclays Margin FX provides two platforms to those wishing to trade Foreign Exchange with them. 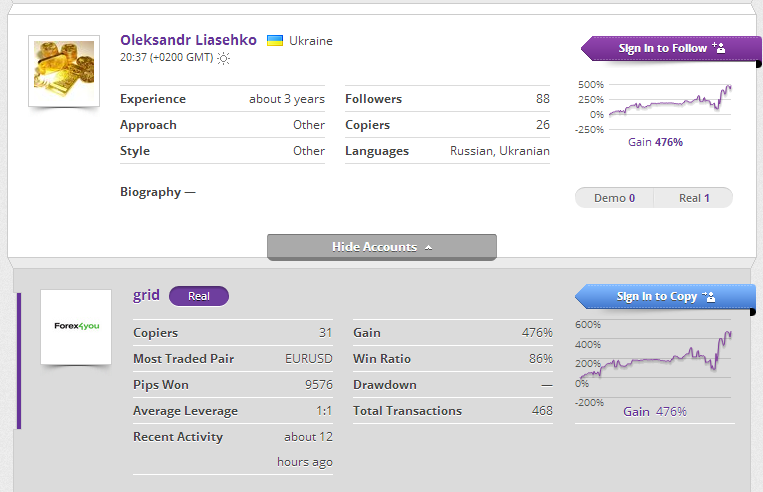 The first is a WebTrading program that I had a play around with. To be honest I wasn’t particularly impressed with the program. While it was perfectly functional and allows for traders to open and close positions. It was then I noticed that the Barclays platform was powered by FXCM. Apparently back in October 2012, Barclays chose FXCM as their technology provider. This essentially means those who trade with Barclays Margin FX are using FXCM’s price feed and platform with Barclays operating as its own liquidity provider. While this doesn’t present any real problems it does mean you stuck with using a relatively weak web or download platform. For instance there is no option to use the ever popular MetaTrader platform when trading with Barclays Margin FX. This is a bit annoying and significantly limits the kind of trading activity you can engage in. There is also no support for Mobile Trading something which is becoming increasingly popular. There is nothing particularly Special about the Barclays Margin FX offering. Your essentially just trading with the FXCM Web and Download platforms with Barclays acting as the counter party. Barclays Margin FX operates with the Market Model brokerage model so it is unable to offer the incredibly tight spreads you would expect from such a major a banking institution. The main attraction for potential customers is the possibility of trading Forex with a well known and well regarded international bank, with Barclays having a very strong reputation when it comes to brokerage services. The Spreads at Barclays Margin FX aren’t bad and are among the better Spreads to be offered by brokerages operating using a Market Maker Model. For instance, the target Spread on the EUR/USD is 2.1 Pips which while not mind blowing isn’t bad either. However Spreads are often significantly wider than the quoted target spreads featured on the Barclays Margin FX Website. As there are a number of other brokerages who offer similar if not tighter spreads it makes me question why individuals would choose to deposit cash at Barclays, considering the lack of a sophisticated trading platform and the limited leverage offered by the service. I can think of a number of MiFID regulated brokerages who offer equally as tight spreads, while also offering their customers significantly more leverage. This has to be one of the bigger selling points of the Barclays Margin FX service. Barclays Margin FX is operated by Barclays Brokerage arm, in general Barclays has built a good reputation as a financial broker offering a variety of financial instruments including Stocks, CFD’s, ETF’s and Financial Spread bets. I know a number of people who use Barclays Brokerage services and all of them have been happy with the level of service they have provided. I would suspect that this high standard of service is extended to those using it’s Margin FX platform. As already mentioned Barclays Margin FX is a trading name of Barclays Stockbrokers Ltd. who are based in the UK and regulated by the FSA. While the main arm of Barclays has got itself into a number of regulatory scrapes recently Barclays Margin FX has a totally clean regulatory record with no disciplinary action having ever been taken against them. A clean regulatory record in a country with a strong reputation for financial regulation should be enough to alleviate the concerns of many potential customers. Overall, Barclays Margin FX offer a high level of service, however the platform is let down by its weak user interface. ZuluTrade, is a great social trading platform however many people complain that they often experience heavy slippage when copy some of the signal providers on ZuluTrade. This slippage can sometimes seriously eat into a traders profits. So I undertook an investigation to establish which brokerages experienced the worst rates of slippage. To do this I looked through a selection of ZuluTrades most sucessful signal providers and averaged out the slippage each brokerage had over the past year. Unsurprisingly, AAAFx had the leas slippage out of the all brokerages offered on the ZuluTrade platform. As AAAFx is totally integrated with the platform this is what you would expect. However, much of the rest of the list is quite shocking for instance I do not think that many people would expect that some small players in the world of Forex would suffer as little as they do. Slippage of under a single Pip would still allow most people to make money from copying ZuluTrade’s better signal providers. Both Gain Australia and Gain UK did pretty well (for those not in the know Gain operates Forex.com). Lagging back in 10th place with Slippage of less than 1 Pip is xemarkets of Cysec. So it does appear that there are a number decent regulated alternatives to trading with AAAFx, however none of the alternatives come close to AAAFx in terms of slippage. However a number of these brokerages listed offer spreads that are considerably tighter than the Spreads offered on AAAFx. This means that AAAFx may not be the best choice for those wishing to use the ZuluTrade platform. Now for the naming and shaming of the brokerages that suffer the most slippage on the ZuluTrade platform. Some of the slippage experienced with these brokerages is completely outrageous. KVB KUNLUN customers suffered average of 4.28 Pips of Slippage which would seriously eat into a traders profits. Again things aren’t much better for customers of YouTradeFX who suffer an average of 3.29 Pips of Slippage. Whats worse is that some of these brokerages featured on our shame list aren’t particularly competitive when it comes to the Spreads on offer. If you are currently trading with one these brokerages I suggest that you move to a different provider. My study of Slippage on ZuluTrade only featured 38 brokerages, this due to the fact that for some of the less commonly used brokerages didn’t have large enough data sets for me to be able to compare them to the properly to the 38 brokerages which did feature in the study. What the study does show is that those using ZuluTrade should ensure they pick a competitive brokerage in terms of both slippage and spreads. Broker Independent supports a range of regulated and unregulated brokerages. Tradeo is not regulated by a financial regulatory body itself. Commissions for signal providers not stated. Number of traders on network: Around 5,000 different traders on the network at the time of writing. Tradeo is an independent broker meaning that it doesn’t take on it’s on clients trades or give preferential treatment to a particular brokerage. Rather Tradeo earns its revenues by entering into revenue sharing agreements with the brokerages it operates with. Tradeo has a reasonably large user base of traders though it should be made that not all of the registered members are trading on real accounts with a number of the users trading on demo accounts. I would have to say that Tradeo is rather a small social network in comparison to some of the more well known Social networks such as eToro and ZuluTrade. Tradeo supports a range of brokerages both unregulated and regulated. Some of the better known brokerages supported by the Tradeo platform include FxPro, Alpari, AVA FX, Markets.com, easyforex and FXCM. The range of brokerages supported by Tradeo is pretty impressive and you will certainly find a brokerage which will suit your needs. However, the support for the various brokerages varies quite significantly. For instance Tradeo is very proud of the bridge it has recently put in place with FXCM. But as far as I am aware none of the supported brokerages have the Tradeo platform fully integrated with the social platform. As is the case with AAAFx and ZuluTrade. It should be noted that ForexGlobes plans to provide such an integrated solution with all of its brokerages when it exits it’s beta period. This is somewhat a negative in regards to Tradeo, it should also be noted that all the major brokerages supported by Tradeo are also supported by their rival ZuluTrade. So it seems unclear to me why one would pick Tradeo over ZuluTrade. There are a wide selection of traders to follow, while the selection isn’t as wide as the likes of ZuluTrade and eToro there is still a huge selection of different traders to pick from. With many traders having a great track history posting returns of 5000%+. The narrower selection traders is something of a downside to Tradeo, and it should be noted that there are a number of traders/signal providers who are operating their Tradeo accounts with the use of a demo account. This being said a diligent individual should be able to find a number of traders who they will have great success following. The search functionality is not quite as good as one would hope it to be, put this doesn’t prevent you from finding good traders to follow. Overall, Tradeo offers a reasonable Social trading experience though I do feel that it will struggle against its bigger rivals such as eToro and ZuluTrade. The non-exchanged traded Binary Options industry has expanded vastly since their inception in early 2008. The growth in the number of competing Binary Options platforms has been powered by a number of platform providers providing cost effective and easy to implement platforms. Whether such growth can continue indefinitely seems questionable but today we are going to outline the offerings of the three largest Binary Option platform providers. SpotOption is the trading name of s.o SpotOption Ltd. The company was founded in early 2008 and sees itself as one of the leaders in the Binary Options marketplace. Currently SpotOption powers over 80 different Binary Option platforms making it the biggest Binary Options platform provider. SpotOption also holds the honor of being the first Binary Options company to become regulated under CySEC after they changed their position regarding the regulation of Binary Options. Again SpotOption can also claim to have provided the platform for the first Binary Option provider to become CySEC regulated. SpotOption provides a 360 solution providing everything from the platforms front end, trading engine, risk management, payment processing, customer relations and a content management system. Meaning that those who opt for a SpotOption provider can get hold of a platform that almost runs itself. For a good example of SpotOption platform one should check out Banc De Binary, who happen to hold CySEC regulation and our one of SpotOptions biggest brands. SpotOption supports data from a number of different financial feeds including Leverate, Reuters and Bloomberg allowing the platform providers to pick which data feed they utilize. However, SpotOption claim that the real strength of their platform is their risk management they provide. SpotOption provide a five tiered risk management system which they claim can help ensure platform providers make a consistent 10-12% profit. The Client can access all the features they need through the CRM including information on customer leads, depositor management, back office features, accounting and affiliates. SpotOption also provides one of the cheaper platform solutions which is partly why it is so popular. Launched in 2009, Techfinancials was launched by a group of financial experts who wanted to enter into the lucrative Binary Options marketplace. Techfinancials supports a much smaller number of operating companies, though their clients do include a number of big names including 24Options. Techfiancials see Binary Options as instrument which will allow individuals the ability to access the financial markets and envisage CFD companies offering Binary Options alongside their traditional Contracts for Difference. The Techfinancials Binary Option platform is powered by Techfinancials unique Ocra+ engine which uses a unique algorithmic model to price Binary options, which then allows traders to close positions/rollover open positions during trading. The Ocra+ engine also allows Binary Options trading to be plugged into the MetaTrader 4 engine which is a pretty nice feature of the platform. Again Techfinancials have a comprehensive back office features largely adapted from online gaming world allowing users of the platform full access to various features including affiliates, marketing, admin and various types of banking functions. The Techfinancials platform is available in both white label and in operator format. For further information on the platform check out their website. MarketsPulse, prides itself in providing Binary Options solutions for already established FX Trading companies and has clients both regulated by the Japanese FSA and Australia’s ASIC. This means the platform is aimed towards those who already have active FX trading services and MarketsPulse is unique in the fact that it doesn’t operate a Binary Options platform powered by their own software meaning they do compete with their clients for customers. They also claim to have a unique Binary Options algorithm powering their risk management systems as they are the only Binary Option platform which can offer clients up to 90% returns on many different Binary Options. However, the MarketsPulse solution is considerably more pricey than the solutions offered by the other major providers. The platform also has the bonus of being able to support any data feed. The platform also allows its users a full backend to allow the company running the service to access everything that they need. While the offering by MarketsPulse is pretty impressive it is going to be out of the price range of most people who want to open a Binary Options brokerage. Regulatory Authority: Regulated under MiFID in Greece by the HCMC. Instruments: Limited Commodities and Forex. Unique Features: AAAFx is ultimately owned by ZuluTrade and therefore is often considered the best brokerage to open a ZuluTrade account with. AAAFx offers MetaTrader 4 as there sole trading platform. MetaTrader 4 is one of the best known trading platforms out there and is popular with many traders who like its professional like functionality. MetaTrader also provides support for Expert Advisors which allows individuals to engage in automated trading. The AAAFx version of MetaTrader 4 works just as one would expect it too. However as AAFx is ultimately owned by ZuluTrade it provides unprecedented support for automated trading through the ZuluTrade platform, with their being no commissions or charges for such trading. Some also consider AAAFx to offer the lowest amounts of slippage for those who are using the ZuluTrade platform, it should also be noted that many of ZuluTrade’s most popular signal providers also use AAAFx to place their trades. There is nothing at all remarkable about the AAAFx platform apart from its provision for those who are using the ZuluTrade platform. The main reason why anyone would chose to trade with AAAFx is that they wish to take advantage of ZuluTrade’s social trading platform. The fact that AAAFx is run by the same company who ultimately operate ZuluTrade means the platform has the best integration with the brokerage. AAAFx offer different Spreads to individual and institutional clients. The Spreads on offer for both individual and institutional clients are pretty competitive for the major currency pairings, with the institutional spread for EUR/USD being 0.9 pips and the Spread being 1.9 pips for individual customers. 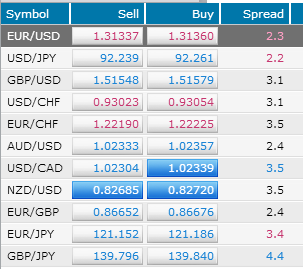 While these Spreads are pretty competitive they are still not the very best around but do allow their customers to trade major Forex pairings with pretty reasonable spreads. However when it comes to some of the more minor Forex pairings the Spreads really begin to bloat with some spreads being particularly huge. So it appears that AAAFx would be a pretty good option for those who only want to trade the major Forex pairings. The Spreads on all other instruments at AAAFx can be outdone elsewhere. Personally I haven’t had any problems with the customer service at AAAFx, but I feel that it is my duty to state that their are a number of reports regarding slow withdrawals with accounts held with AAAFx. Though at the same time their are as many reports of people being extremely happy with the service provided by AAAFx. As far as I can tell there are no suggestions of anything sinister going on at AAAFx. AAAFx has a number of different contact numbers and ways to get into contact with them, meaning if you do have a problem with their service it is very easy to get into contact with them. The only thing that can go against AAAFx is the fact they have been accused of using Spamming techniques to promote their service, though this may be down to over eager affiliates or poor quality SEO services bought from Pakistan and India. AAAFx is the trading name of AAAFx Competitive Trading Solutions Ltd. who are registered and regulated in Greece by the HCMC. As Greece is a member of the European Union this means that AAAFx is bound by MiFID allowing it to operate throughout the whole of the European Union. It also guarantees that AAAFx are regulated at least to the degree set out in MiFID, meaning that individual consumers funds are protected up to 30,000 Euros. However the fact that AAAFx is based in Greece may raise some causes for concern especially due to the fact that Greece is not well known for financial regulation and due to the fact the Greek economy is in a pretty perilous state. Overall, those considering trading with ZuluTrade should seriously consider using AAAFx as their brokerage. Those who are just looking for a general brokerage might be better suited elsewhere. Plus500, is one of the few regulated trading platforms not to offer MetaTrader as trading platform instead offering their own proprietary trading software the Plus500 Windows Trader. Today we are going to take a look at the Plus500 Windows Trader which is the mainin Contract for difference trading platform at Plus500. 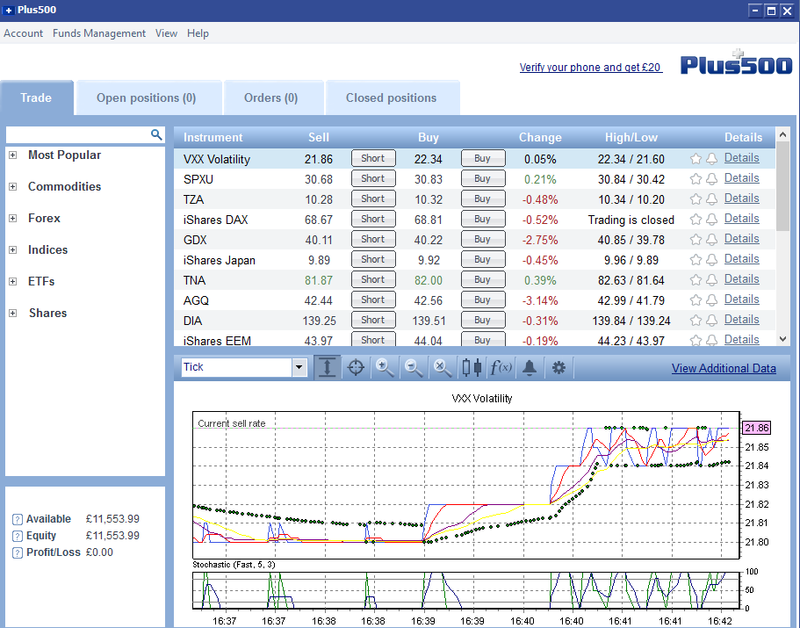 However, it should be noted that Plus500 also offer a web based and mobile platform alongside their Windows Trader application. Once you have installed the platform which shouldn’t take you long as the platforms total build is only around 25mb. You will be presented with a login screen after logging in you will be presented with the screen above. 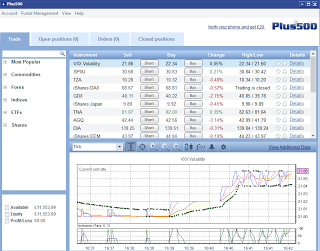 The various instruments available to trade at Plus500 can be found be scrolling through the left hand menu or using the search bar. The search bar is particularly useful as it makes finding the instrument you want to trade a much easier task. Adding technical indicators to charts is easy and is simply a task of clicking on the Indicator tab and setting up the technical indicators you desire. While adding indicators to a chart is simple reading them off the Plus500 Windows Trader is not quite as simply. This has to be one of my biggest gripes about both the Plus500 Windows and Web Trader. I find reading the technical indicators much more challenging than on competing platforms which use MetaTrader or other alternatives. Another annoying thing about the Plus500 platform is that prices are only updated every second or so which can be quite a bit slower than other platforms. This also means that your liable to be re-quoted when you try and open a position in a new instrument, especially if that instrument is volatile. The fact that Plus500’s data isn’t the quickest in the business is part of the reason they ban scalping on their platform. This means people who want to open positions for a very short period of time will do be able to do so at Plus500 and should look elsewhere for their trading needs. All the various account management stuff you may need to do, can be done through the Platform without much difficulty. However customer support isn’t particularly readily available to sort out your problems. The main benefit of the Plus500 platform is that it allows you trade a unprecedented number of different Stocks trading on a number of global exchanges all from one place. However the platform is let down by its poor charting abilities and the fact that individuals cannot scalp which will put a lot of traders off. It saving grace is the large number of instruments available to trade and the fact it offers so less readily available ETF’s and Stocks.